Wellington's army at Waterloo is often described as British or, worse still, English, when in fact only 36% were British. The Dutch (North Netherlands) contributed around 13% of the Allied force, and this set was the first to represent these men. The nine poses in this set include all the usual favourites, though there is only one man advancing/charging, which seems a bit mean even though the Allies spent most of that fateful day defending their position. There are two different marching poses, and one man standing at attention, plus a pose walking and with a ring hand (second row). Items included in this set to fit this hand are a musket, a small drum, a very small drooping flag and a horn. Because the hand is sculpted hanging by the soldier's side, it does not convincingly 'carry' any of these items, which all fit into the hand with a peg except the horn. However this does provide a number of possibilities for one basic figure, particularly for those prepared to do some conversion work, and if merely representing a musician etc. then it has value for wargamers even if the pose is unnatural. The figures are quite well detailed, though there was a noticeable flash line around the mould join on our examples. The style of sculpting is quite good, with properly proportioned anatomy and a fairly natural stance to the men, though of course the ring-hand figure is an exception. Thanks to a careful choice of poses there is no extra plastic hidden from the mould. The set has been further enhanced with some extra heads - not enough for every figure by any means, but still allowing some conversion possibilities. The extra heads are to allow the figures to be used as Belgian (South Netherlands) infantry, or as militia troops, and though limited in number they are very welcome. These men wear the 'classic' Waterloo Dutch uniform, with the Austrian-style shako that sported peaks both front and rear. This shako has been sculpted with a chinstrap, though sources disagree over whether this item ever existed. Otherwise, the uniform is accurate and properly sculpted, with the single-breasted short-tailed coat. The officer correctly has a long-tailed coat, although this has been given vertical pockets when they should be horizontal. The officer wears a sash and has his greatcoat rolled across his body - a common practice - which partly obscures the second of his two epaulettes, which make him a field grade officer. The equipment all looks OK, including the British-style water container, though no one here has a haversack, which is surprising. The men have shoulder rolls, indicating they belong to flank companies rather than the centre. Strictly speaking, if the multi-use pose were given a drum or horn then it should have swallows wings on the shoulders, though clearly that is something the customer will have to do for themselves. The box claims almost half of Wellington's army was from the Netherlands, when in fact the figure is 19%, yet they made an important contribution to the Waterloo campaign, and this set is a significant product for those wishing to represent all the elements in it. 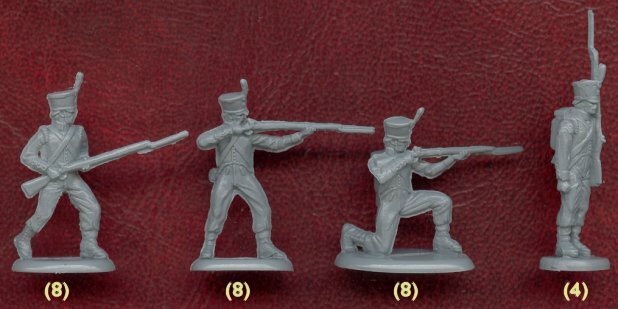 With fair sculpting and useful poses this small collection should go a long way to represent these often overlooked troops at one of history's most important battles.